Qualaxiablog » What is mental fitness? We often say that a picture is worth a thousand words, and the image that we have for a word allows us to define it more easily than in writing. For example, if we say ‘healthy eating habits’, what image comes to mind? Many will picture a healthy food, such as an apple. But what image comes to mind when thinking about mental fitness? People in general draw a blank when asked this question. Do we need an image for mental fitness? Imagine being with a child who wants to ride a bike without training wheels. 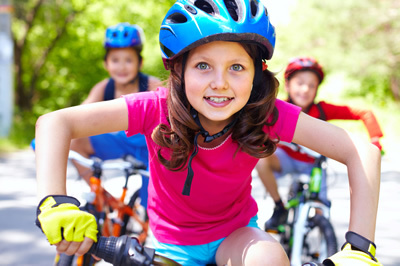 You remove the bike’s training wheels and encourage the child to pedal. For the first several tries, you follow the child while holding on to the seat, making sure she does not fall. Once you are confident the child is able to balance the bike, you let go. The child is able to ride 4 metres without your help, stops, turns back and sees you clapping and jumping for joy! She realizes that she was able to ride the bike without falling, without training wheels, and mostly, without you holding on to the seat. Now, look at the expression on the child’s face. This is the expression of mental fitness. You contributed to improving the child’s mental health by encouraging her to learn a new skill, by giving her autonomy and letting her take control of the bike. Lastly, and most importantly, you encouraged and supported her in her learning, and allowed her to spread her wings. When talking about mental fitness, we want to emphasize the abilities and skills that we possess, our abilities to make choices and the positive relationships we have with those around us. Now, what image comes to mind when referring to the mental fitness of a person, community, family, work environment or of vulnerable members of the population?